After over a decade in the industry, learning which lures were good and which products were just plain garbage, Captain Bryce Poyer wanted to make something that was both affordable and worked well in a variety of different conditions. Bryce and the entire crew at White Water Outfitters and White Water Marine all had a hand in designing this new product line. Bryce mentioned that, "It was a real community effort from a lot of different people. Our own charter boat and staff combines for over 200 years of experience fishing the Hudson Canyon. 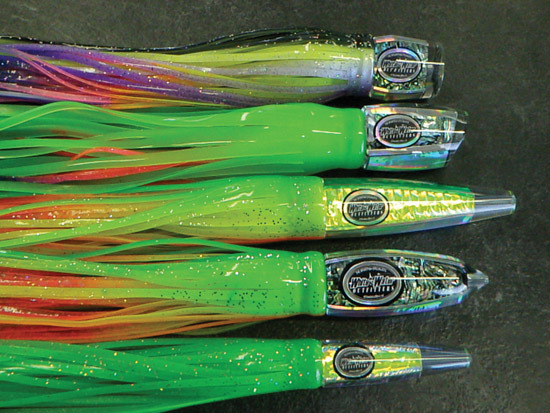 We really knew what we wanted in our lures and made it a reality." After years of design, engineering and real-world testing emerged a new line of high-grade, no non-sense gear. First and foremost, the lures are virtually indestructible and should last a lifetime. They are modestly priced for all budgets and feature simple, effective, no gimmick designs. All White Water Outfitters custom lures are bench crimped by full time pros using only the highest-grade components. If you really want to impress the other guys at the dock, you can customize these lures with your boat name, different colors, etc. For more information on these new offshore lures, visit their brand new tackle shop that opened up for business in May 2009. White Water Outfitters carries a full line of live, fresh and frozen bait as well as a large selection of rigged, unrigged and custom rigged offshore baits like ballyhoo, mullet, Spanish mackerel, squid and flying fish. In addition, they also carry a full line of offshore, inshore and surf rods, reels and tackle. This new location has about a dozen new and used boats on display including Contender, Parker and Jupiter as well as in-house Blue Water Boat brokers who specialize in larger boats. White Water Outfitters, 243 Montauk Highway, Hampton Bays, NY 11946. The location features ample parking or travel by boat and dock at their new 250-foot floating dock. Call 631-594-3336 and ask for Bryce or visit http://www.whitewateroutfitters.net/ .